When I was young, we had your typical Christmas traditions – singing carols on Christmas Eve, eating waffles on Christmas morning, arguing with your siblings by Christmas afternoon. You know, the usual. My kids are growing up just a little bit different. 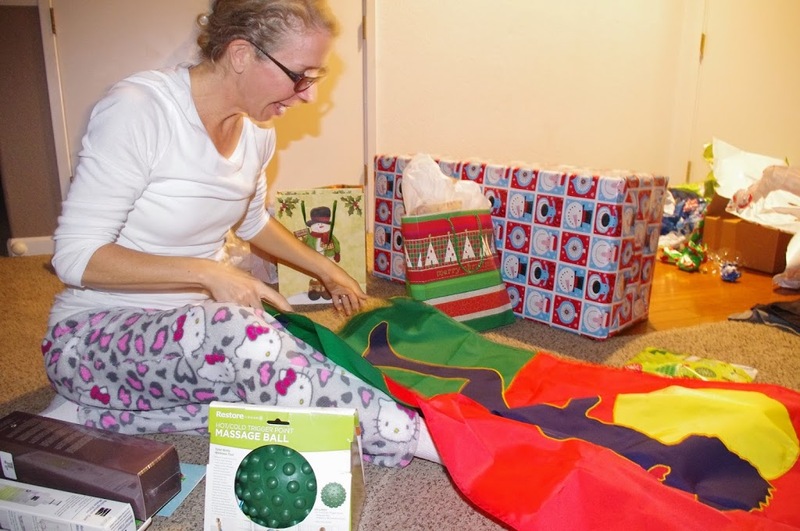 Oh, sure, we wake up early and go crazy for the gifts like every other family, but under our tree we’re more likely to find DriFit shirts, foam rollers, a running garden flag, and safety whistles (which, OMG. UltraIronHubs could not leave alone! It says right on the package, “This whistle is extremely LOUD, do not allow children to play with!” I’m pretty sure he took that as a personal challenge.). Yes, I have Hello Kitty pajama pants. Doesn’t every middle-aged woman? 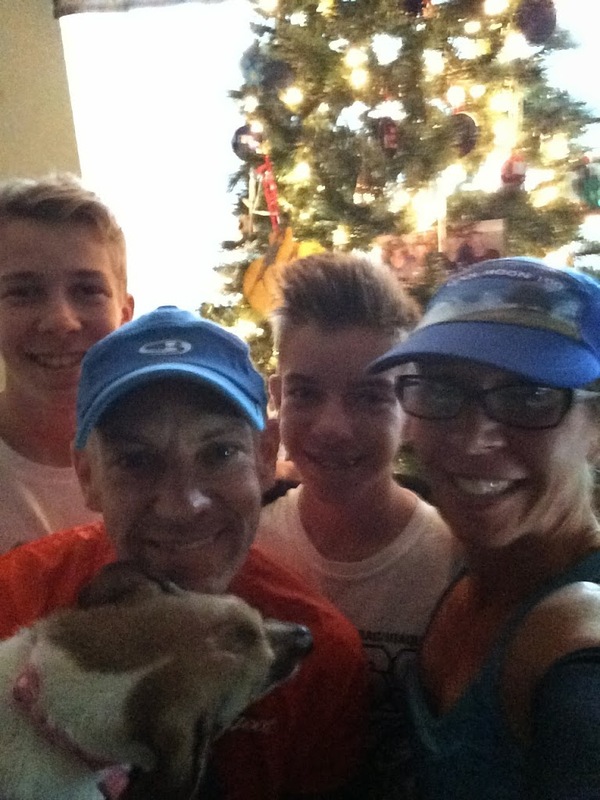 We don’t really do the waffle thing around here, either, but I did scramble up some eggs so we’d be fueled for my most favorite Christmas tradition in the whole wide world: the family run! Blossom really did not feel like looking at the camera. I took about five of these and you can’t see her face in any of them. We only go a couple of miles, but we’re all together and everybody has to run my slow pace, so it makes me a happy mama. This year Santa brought UIH a point-of-view camera, so of course he had to try it out! Here’s our two mile run condensed into about a minute and a half. You might not want to watch it if you’re prone to seizures or motion sickness. After we were done with the 2-miler, I asked Little Boy to get in a few more miles with me, so we went out for another four. 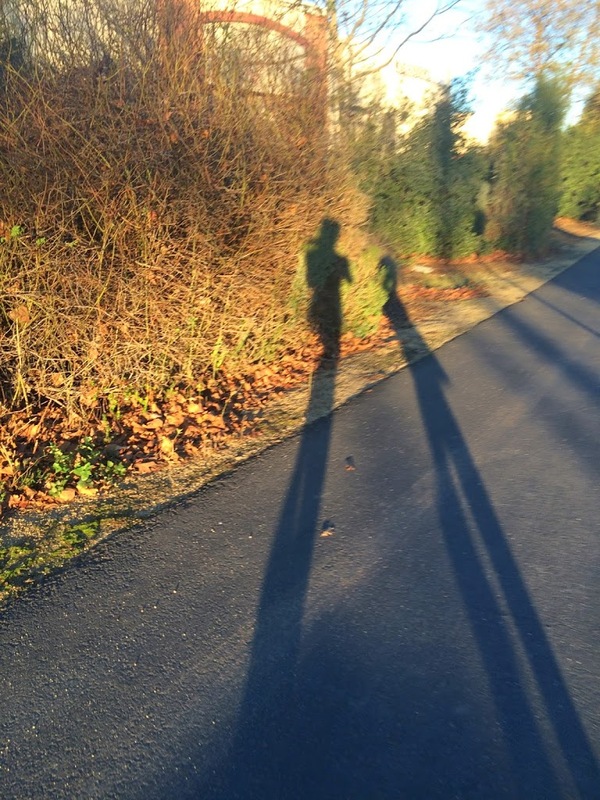 I love running with Little Boy when it’s just the two of us. He’s a kid of few words much of the time (mostly because Big Boy talks SO. MUCH. ), and it’s nice to hear his thoughts. We both smiled, even though it’s a shadow selfie. Some habits you just can’t break! I hope you had a nice holiday, too! What’s your favorite Christmas tradition?? A running garden flag! NEED! Sounds like you have great traditions. I come from a very dysfunctional mess of a family so there sure as hell were no waffles. Haha! As long as we learn from it, right?